Sri Lanka’s leading ornamental fish exporter Aquamarines International Ltd. was established in 1963 and operates as a BOI enterprise. The company specialises in breeding of ornamental fish particularly varieties of tropical sea fish and invertebrates targeting exports markets in the United States, Europe and Far East. The Chairman and founder of the company is Ananda Pathirana. Pathirana stated that throughout the company’s existence, BOI had always been supportive and fostered the growth of this industry. The main facility is at Ratmalana but the hatchery is located at Ja-Ela. The company has currently about 80 employees. Aquamarines International Managing Director Yohan Pathirana, who sadly passed away recently, had shared some of his expertise about the ornamental fish industry at the Aquarama 2017 forum and exhibition held in Guangzhou, China. His passion for fish led him to discover a native species which was named in his honour by Dr. John Ernest Randall, ‘Pemberis Pathirana’. The most remarkable aspect of this company is the fact that they are the only company that breeds sea horses and pipe fish in Sri Lanka. The fish bred at Ja-Ela are imported varieties. For example sea horses are originally from Brazil while the pipe fish originate from Indonesia. The Ja-Ela facility is built on 5 acres of land and includes many breeding tanks for the fish and marine invertebrates such as cleaner shrimp. 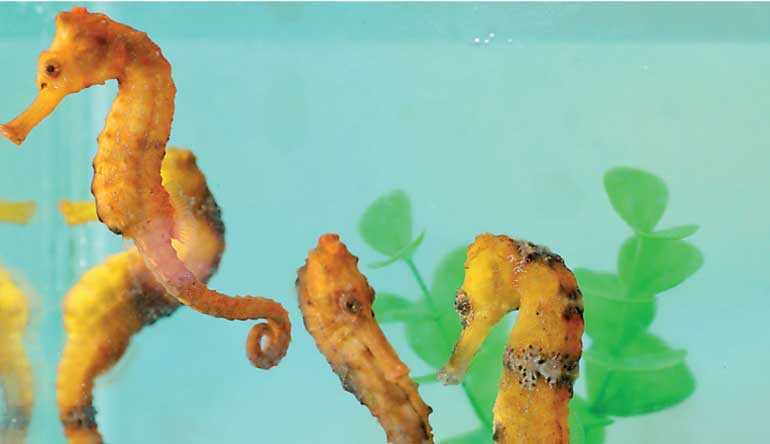 Most of the tanks are devoted to the breeding of sea horses which include several containing tiny hatchling sea horses which are barely ½ cm in length, to other tanks holding fully grown adult sea horses. The breeding of sea horses is complex as it is the male fish that carries the eggs and a total of 300 to 400 are born alive. The company also breeds about 200 varieties of brightly coloured clown fish which are the mainstay of Aquamarines International Ltd. Perera stated that the export demand for Clown fish is in fact a little higher than that for sea horses. Several of these Clown fish varieties are rare including the variety known as “Platinum” which fetches high prices because it is difficult to breed. Sri Lanka is a major exporter of ornamental fish with markets in the USA, Japan and the European Union. There are about 40 regular companies in Sri Lanka of which several are BOI enterprises that engaged in breeding and exporting these ornamental fish. The market is divided into several components that include marine, freshwater, and brackish water fishes and marine invertebrates. Marine fish and invertebrates are collected by experienced scuba divers from waters around the island. More important is the freshwater fish industry where the fish are commercially bred. Most freshwater fish exported from Sri Lanka are freshwater varieties such as Guppies Swordtails, Platies, Tetras, Angels, Gouramis and Catfish. Of these the single biggest category are fancy Guppies which constitute about 60 to 70% of the market of freshwater fish exported from the Island. It is estimated that Sri Lanka’s Aquarium Fish industry grows at approximately 4.7% annually. Sri Lanka’s market share is 2.7% of an estimated world market valued at around $ 412 million. 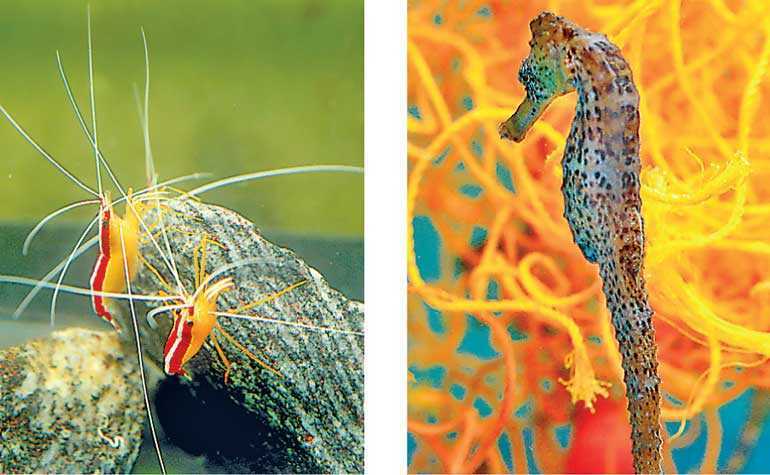 In the future the focus will be on high value marine ornamental fish of which many are rare or endemic to Sri Lanka that will be bred by local exporters of ornamental fish.